SAN DIEGO (KGTV) - A woman died Wednesday at Sunset Cliffs, according to lifeguards. 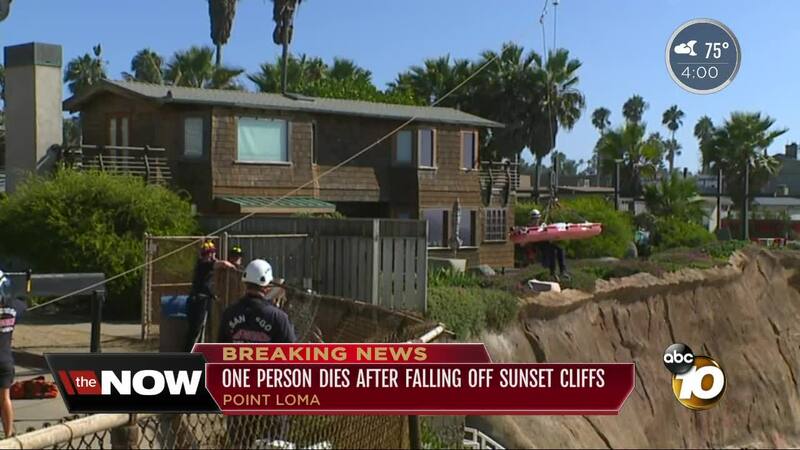 The incident happened about 2:30 p.m. at Point Loma Ave. near Sunset Cliffs Blvd. San Diego Police and Lifeguards used a boat to reach the woman's body, which was on the sand in a cove. The fall from the bluffs is about 30 feet. Crews on the scene worked quickly as the tide moved in. High tide will take place at 6:51 p.m., according to tide charts . Neighbors say the staircase to the beach at Point Loma Ave. is blocked off, and the woman may have been climbing on the bluffs. A woman matching the same description was seen on the bluffs Tuesday, neighbors told 10News.